When I served split pea soup at an annual holiday party, a dear family friend who is well known for her prowess in the kitchen drew me aside and asked me how I made it so thick and smooth. I was astounded, mostly because it’s just physics—with a little patience, any fifth-grader could do it. 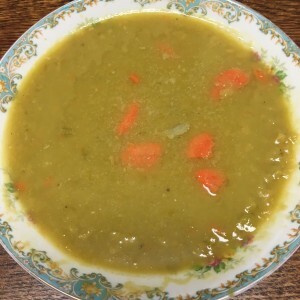 For some reason though, many cooks are intimidated by this simple formula for “pease porridge,” the precursor to today’s split pea soup that is celebrated by the Old English nursery rhyme. 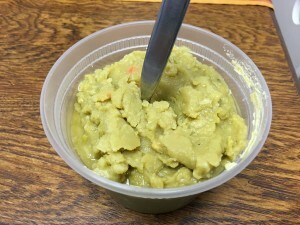 There is no trick to making split pea soup—it’s the same kind of cooking magic that takes place when you make peanut butter in the food processor: you watch the peanuts rattling around in the plastic bowl in thousands of discrete, tiny pieces, and then, imperceptibly, in the space between blinks, the harsh clattering is replaced by a new sound. The hard, dry legumes release their oil, liquefying right before your eyes. A similar alchemy takes place when heat is applied to split peas and water. After some time—usually about 45 minutes—the peas almost magically transform from discrete objects floating in a thin broth into a thick, smooth porridge that you could stand a spoon up in—especially by the next morning. If there is any secret to this soup that divides the cooks from the chefs, it would be an extra ingredient and an extra step: Although the parsnip may not be indispensable it adds a delightful sweetness, and cooking the peas and vegies separately keeps the vegies from turning to mush before the peas thicken. As you can see by the directions, this soup is literally as easy as one, two, three. It has nourished three generations of my family, but it goes back, in one form or another, many thousands of years. Cooking soup must be one of the first ways we said to ourselves, “We are human.” Apply heat to indigestible herbs, dried beans, and root vegetables, and transform them into nourishing food— that must have been a powerful incentive to bring people together around a flickering hearth. What could be more civilizing than making soup? Place the dried peas in a large pot with water and salt and bring to a boil over high heat. Reduce heat to low and gently simmer for half-hour to 45 minutes, until peas are starting to break down. Meanwhile, in another large heavy pot or Dutch oven, heat the olive oil over medium-high heat and sauté the onions, celery, carrots and parsnips with a pinch of salt and pepper until they begin to soften and color, about 5-8 minutes. Remove from heat and set aside. When the peas begin to disintegrate, add to the vegetables and simmer for an additional 30 minutes or so. When the soup starts to thicken, add noodles, pepper, dill and an extra cup of water and cook for another 10 minutes or so, until peas have completely pulverized and noodles are tender. Re-season to taste and add more water if soup is too thick. Tip: Add additional liquid as needed and stir often to prevent scorching. Ruth Goldstein is a retired registered nurse, sporadic journalist, community advocate, and lifelong resident of Pikesville. A practicing vegetarian since she was a college student, she has been inventing recipes and writing about food for more than 30 years. In addition to her cooking practice, her other areas of interest are human rights, end of life issues, teaching English as a second language, and gardening. She spends her leisure time watching British TV dramas, following politics, reading in bed, and dreaming about future art projects. Contact the author.